You may have seen this photo on the news today. 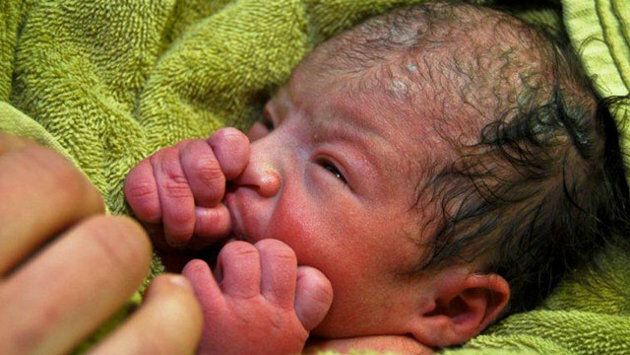 Patrolling Polish soldiers found this little girl abandoned on the side of a road in southern Afghanistan. How frightening it must have been to go near the towel in which she was wrapped, no one else around for a mile! The soldiers knew the risk of hidden roadside bombs along the route to their Waghez military base. But they were brave enough to look within. I cannot imagine the pain her mother could be suffering, to have left her daughter this way -- or to have had her taken from her. Who knows what led up to this infant being left behind? Those who practice Ho'oponopono may also find something useful here. In many trainings I've heard how we so often abandon own inner child, or Unihipili, and do not take care of it. We may not even realize this is happening. How this child has suffered inside us, for eons! Being the container of all unconscious memories plus the runner of our bodies, our Unihipili carries major importance to our survival. It also connects us with higher aspects of ourselves, linking us directly to Divinity. Ho'oponopono trainings teach practices for caring for our Unihipili in a moment to moment way. It can also be like a "bomb" in our lives, if we don't -- and we'll wonder what happened when situations continue blowing up. It makes itself known, and we can befriend and love it if we choose. I often think of people dealing with trauma, who shut off their inner responses to get through the day. Later there are flashbacks, insomnia, hypervigilance, irritability, and the sense that nowhere is safe. Learning to care for ourselves -- especially our more "primitive" parts -- is an essential lifetime journey, even without histories of major trauma. I salute these Polish soldiers for taking a chance on this little girl -- and giving her a chance too. So young, she would have died otherwise. What about your own inner child? Is s/he safe inside you? I'm hugging mine very gently today, while cleaning along with this story. Thank you Morrnah Nalemaku Simeona, for the processes in Self-Identity Through Ho'oponopono that offer us peace no matter where we are. Seeing this quote today, I'm inspired to share it on this blog. It applies to all of us, no matter what our religious or cultural backgrounds might be. Practitioners of Ho'oponopono also speak of taking "100% responsibility" for everything showing up in our lives. Next to understanding about one's personal identity and connection with Divinity, this may be the most important concept in Ho'oponopono. Yet for many it can be confusing. It seems to ask us to take on much more than we feel is ours. What about personal boundaries, after all? What do WE have to do with riots in the Middle East, or genocide in African nations? And what about codependency -- a state of blurring between what's ours to do, and what belongs to others? In codependency, we try to control the alcoholics or addicts in our lives rather than deal with our own issues. 12-step programs warn against taking other people's inventories, and rightly so. 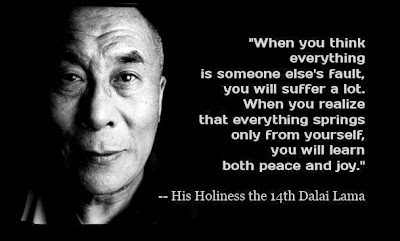 So how do we understand this idea from the Dalai Lama [and his seeming brother in heart, Dr. Ihaleakala Hew Len] that "everything springs only from yourself"? How do we work with this in our own lives, without becoming overwhelmed with the magnitude of suffering in the world? I believe that when we're at peace, we can sense our interconnectedness with all of life. We are all made of the same stuff. We share molecules in continuous dynamic exchange. Dr. Hew Len often tells us that we share eons of memories (or data) too. A more folksy way of saying it might be: "If you spot it, you've got it!" And the world can change, the instant our own perceptions of anything within it change. According to Ho'oponopono, we are perfect beings -- but the data that runs us (and through which we experience life) can be pretty scary. The process of "cleaning" in Ho'oponopono means owning the fact that our experiences may be skewed, and that only Divinity sees things as they truly are. In cleaning, we're taking care of our own experiences -- no one else's. We can accept all opportunities to let painful data (skewed experiences) go -- with the help of Divinity. Ho'oponopono holds that if we don't do this, ALL our suffering will only increase. The Dalai Lama states this very succinctly also. Additionally, taking 100% responsibility allows us to be our truest, most powerful selves rather than victims. But if all that happens to us is everyone else's "fault," we can never be anything but victims. In this sense, taking responsibility brings great freedom. We can clean, and receive divine inspiration that moves us into perfect action, joy, and peace. I don't know whether the Dalai Lama and Dr. Hew Len have ever met in this lifetime. But I'm sure we're all sharing the same molecules, memories, and opportunities. And it warms my heart that their messages are so very similar. Ho'oponopono Cleaning: Which Tool For You? Many people think that in order to do Ho'oponopono properly, we must direct our cleaning efforts towards particular problems that arise in our lives. Examples might be traffic jams, financial crises, health issues, or arguments with family members. I used to think this too. Thus, I wanted to know specifically how to "clean" with whatever problem was happening, when it was happening. What particular process or tool should be used for each? "Memories replaying dictate what the Subconscious Mind experiences. The Subconscious Mind experiences vicariously, mimicking, echoing memories replaying. It behaves, sees, feels, and decides exactly as memories dictate. The Conscious Mind too operates, without its awareness, by memories replaying. They dictate what it experiences as research studies show . . . . . The Subconscious Mind and Conscious Mind, comprising the Soul, do not generate their own ideas, thoughts, feelings and actions. As noted before, they experience vicariously, through memories replaying and Inspirations." This means that the thoughts we're "thinking" aren't coming from us; they're either old memories replaying, or Divine Inspiration. We don't know which, at any particular time. But, I know which one I'd rather have directing me! Depending on how you look at it, this makes life either extremely disconcerting, or extremely freeing. If we never know which thoughts are which, how do we know what to do? 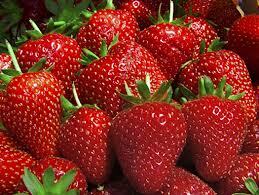 How do we know when to use strawberry, "I love you," or "light switch," with a given situation? Also, this arrangement means that we may not be cleaning with what we THINK we're cleaning with, at any particular time. Layers upon layers of complexity, and eons of added "stuff," are going on behind the screen we're focusing upon. Divinity knows, of course, and we don't. We could get really obsessive and upset about all this. But the more freeing alternative is simply to recognize we don't know -- and clean no matter what shows up. We can ask Divinity for "how," and do it. "I love you" is elegantly simple for this purpose -- or anything we're guided to do. The choice we're making says it all. If we work with this idea, then whoever or whatever appears in our lives is there to be released -- whether we'd objectively call it a "problem" or not. After all, as Dr. Hew Len is fond of saying: "A problem is only a problem if we say it is." Maybe these events, experiences, interactions, etc, are just opportunities to make amends. The other part that's freeing about this, is not having to worry so much about all those Ho'oponopono cleaning tools and what they're "supposed" to do. Yes, we receive a whole manual of them in Ho'oponopono trainings. They each have their history, and might appeal at different times. It's wonderful to have choices that bypass the conscious mind. But the bottom line is that in choosing to use any of them, we're allowing Divinity's help rather than persisting on our own! Blueberry, Strawberry, Gingersnap, Candy Cane, Thank You, Hawaii . . . . all are simply ways to begin the process. And this can go on no matter what happens. Constantly. I believe it starts with intention, and re-deciding 10,000 times a day or more, perhaps. It's a pathway to freedom from entanglement in whatever has gone before. Peace is the result -- the peace that passes understanding. I have really enjoyed previous conversations, and plan to listen in with this one too. If inspired, please come -- and bring your strawberries, blueberries, or other cleaning tools of choice. Most of all, bring your open heart. Someone wrote me not long ago asking about relating to our Inner Child -- or Unihipili -- in Ho'oponopono. We're encouraged to ask this part of us to "clean," even when we're asleep or otherwise engaged. We can become an inner team this way, aligning all parts of us with Divinity. It's a very good question, since the person was wondering whether this would be establishing a relationship under false or exploitative pretenses -- just to get the Inner Child to "do" something for us. In Ho'oponopono, the Inner Child is the part of us containing all the unconscious memories which can surface as problems like illness, miscommunication, money issues, relationship discord, etc. The Inner Child also runs our bodies -- and needs care from the mothering part of us, the Uhane. If we don't clean, our Inner Child continues to suffer. If we choose to clean (as our Uhane can start the process by saying "I love you") it can let the painful memories go. In Ho'oponopono training seminars, we're shown specific processes to connect with our Inner Child -- not just to "use" it, but to authentically love it. Many of us may not have experienced this kind of love in our lives, so it takes some practice. But through the methods Dr. Ihaleakala Hew Len and other wonderful Self-Identity Through Ho'oponopono teachers share, it can be done. It does require daily practice, though. Once you realize this part of you has been abused and neglected throughout time, you develop an attitude of care and compassion towards it -- genuine love. As a doctor, I think this models good self-care, too. There are processes for preparing the Child to go out into the world, for stocking a bag of supplies he/she may need, helping him/her to feel safe, giving gentle affection, and more. This is very different from running mindlessly through life, not considering what we may need as simple humans. Through our behavior and choices in each moment, we're showing our Inner Child how we approach life and its events: through cleaning, rather than getting embroiled and inflamed in them. All that stuff comes from memories or data we hold inside anyway. Best to ask Divinity's help in transmuting and letting them go! Eventually, the Child learns from us, and wants to do this too. It pleasures in joining in. And interesting things happen, when we relate this way. Yesterday, I was sitting in a seminar in Phoenix, with ~100 other people. Things were going along, but were not finished. Inside I began to feel uncomfortable, not sure why. The speaker was engaging, energetic, and entertaining. I tried to listen, but my inner discomfort intensified. Finally, I picked up my things and quietly left the room -- went straight to my car and drove home. No questions, no discussion, no confusion. 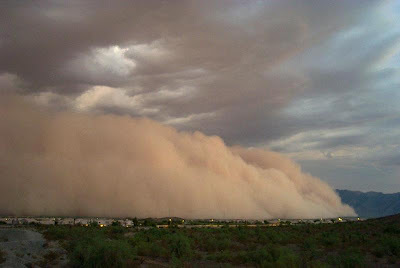 As I rode down the freeway, my car radio blasted a warning: a gigantic dust storm with 60 mph winds was on its way! I looked in my rear view mirror, and could see it mushrooming behind me. By leaving early, I had escaped having to drive through it. Just barely. I can't prove it, but I believe cleaning with my Unihipili let it tell me when to GO, even though my conscious mind didn't understand why. It wasn't logical to miss the rest of a seminar I'd paid for. But that's what happened. Dr. Hew Len says the relationship with our Unihipili is the most important relationship we'll ever have. I believe he's right. Thank you, Dr. Hew Len. My house needs painting; a spa renewal, even. The sun is relentless here in Arizona, and summer is knocking on the door. You're never quite ready when The Heat arrives, as it's so often abrupt. You go to bed in pleasant springtime warmth, and the next morning . . . . BLAM! An oven greets you on opening the door. My body sometimes protests these changes (which still feel less painful than humidity back east). Yet my house endures all kinds of weather -- including hail, monsoon rains, freezing, and desert inferno -- without complaint. Signs of wear have been showing up though: some flaking paint, and some color fading where the sun scorches it most intensely. My home has cared for me well in the 6 years I've lived here. It's time to return the favor, so I've been interviewing painters and getting estimates for the work. (while Ho'oponopono cleaning, of course). The folks coming over don't realize they're teachers, but they are. He'd been in business 4 years, and shared that he was making over 1 million dollars a year now. Business coaching helps, he said. Of course, he doesn't do the painting himself -- he has crews to do that, all good workers. He walked around the house, but didn't seem to be examining it closely. I pointed out to him the areas of concern. He talked about power washing, masking, and painting -- with paint "as good as" Dunn and Edwards but less expensive. After all, Consumer Reports says so. I cleaned with "thank you," and said I would get back to him. His estimate was fine; less than I expected. Next guy comes a few days later, within his 2-hour time window. He's jovial on a hot day, dressed in white tee shirt and jeans -- fresh from an ongoing job. His hands are a little paint-y, but they're strong and his handshake is firm. He's been in this business over 20 years, and enjoys it a lot. He does all the painting himself -- sometimes with a helper or two, but he's always the main guy working. He described prepping before the actual painting, and pointed out places that needed caulking and such. "Some people just slap paint over those spots, and think you won't notice. But I know they're there, and that's not the way it should be done." It helps that he's not only a painter, but a master craftsman and builder. Experience teaches you things. He described another job that was tough, involving pulling up linoleum before laying down tile. It would be "easier" to lay the tile on top of the linoleum -- but it might not last. He attributed his habits to his father, whom he'd bucked as a teen but was grateful to as an adult. "He always did things right, even when it took longer or was inconvenient. And that's how I turned out." Sometimes co-workers might say, "It's too hard!" But he'd learned to "just do it" anyway. "When it's hard, there's just certain things you have to do. And I do them." I couldn't help but think of Dr. Ihaleakala Hew Len, speaking of Ho'oponopono. Sometimes cleaning is the last thing we want to do. It's so much easier to blame, complain, and procrastinate. But as Dr. Hew Len has told me countless times: "Just DO it." So many times in my life since Ho'oponopono, I've come to decision points. They happen thousands of times a day. I can whine and make excuses, or clean and get down to work. I can analyze, or clean. Sometimes things get away from me, and I find myself saying "it's too hard!" Or, "But he was mean to me!" And Dr. Hew Len's voice will come from within, bringing me back to center. 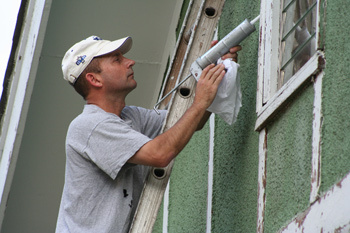 I think similarly of filling in stucco cracks, pulling off old weather stripping before painting, and replacing it after -- and caulking around windows. It's tedious, a lot like Ho'oponopono. But I think my house will appreciate the extra time and care, along with some good, long-lasting paint. People who have practiced Ho'oponopono for a long time say that everything -- including houses -- has its own self-identity, just like we do. Another reason for taking care of it, even when it's hard or inconvenient. I've just returned from the Big Island of Hawaii, where I had the good fortune to attend IZI LLC's Self-Identity through Ho'oponopono Basic II seminar. It felt very important to me to be there, since they have not offered this class in many years. I always learn deeply from Dr. Ihaleakala Hew Len, both through his words and example. He shared many aspects that were new to me, such as soul restoration and additional ways to clean. And yet, the primary reason to be there did not seem to be gaining "information." Instead, it seemed to be the process of cleaning itself, especially for the land we were on. Over the 2 days, he asked multiple people to speak. When he came to me, I had no words . . . just a feeling of absolute stillness and peace. Having come through a challenging last few months, this was a great relief for me! I tried my best to express it, and hope it came through. What was happening for me most of all was the feeling of communion with the wind, water, birds, plants, flowers, and earth. I found myself wandering out to the grass, walking on it gently in bare feet and saying "thank you." I know this sounds strange. Fly all that way to go talk with the land? It happened. There were whales, too. Spouting, spy-hopping, flipper-flapping humpback whales, doing what they've done for eons. It filled me with such love I cannot describe. On top of it, a full moon by the gently lapping sea. I still feel the breeze, and hear the waves. What I want to say about Ho'oponopono for me, is that it is not about getting more wealth, happiness, relationships, jobs, or business. It may well pave the way for these things, and many people focus on them in speaking about Ho'oponopono. Yet these attributes are not its main purpose. For me, Ho'oponopono is a process between my triune self and my Creator. It's about communion, being who I truly am, and letting go of all the stuff I've accumulated that is not really me. It's about humility and gratitude for being alive in this time, able to make amends for all my impatience, errors, judgments, and opinions about the way I think things "should" be. I don't mean becoming passive or hopeless. I mean embracing the full catastrophe of life, as Jon Kabat-Zinn PhD has written. It means responding as best I can in each moment -- in my Ho'oponopono cleaning and in peace, allowing Divine Inspiration to come through. There are many ways to live in peace; Ho'oponopono is this for me. It is a guide for living life. Somehow, joy seems to be coming naturally all on its own as I practice. Perhaps we humans need to be enticed into such a practice at first, with hopes of what it can bring us. Some books, products, and seminars about Ho'oponopono are advertised this way. One example is Joe Vitale, who has helped publicize Ho'oponopono widely. I met many people at the seminar who live in the Islands, yet had not even heard of Ho'oponopono until reading Vitale's (and Dr. Hew Len's) book, "Zero Limits." I am grateful, even though my first learning about Ho'oponopono came through Victoria Shook's book using it for conflict resolution in groups. So even I had needed a "why". 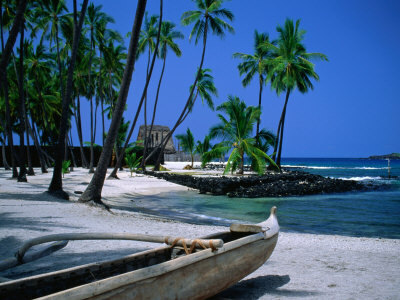 While on the Big Island, I wanted to visit a place that's special to me: Pu'uhonua O Honaunau, the Place of Refuge. In ancient times, Hawaiians who broke kapu laws were punished by death. But if one could could escape his or her pursuers and reach the nearest Pu'uhonua, s/he could be saved. A large wall divides the Place of Refuge from the Royal Grounds; the bones of chiefs buried there give it mana, or power. It is a very peaceful place to me, even though there was certainly conflict and pain on the land at one time. If only it took 50 minutes for any of us these days to reach a place of refuge and peace, would the trip not be worth it? Perhaps this also is what Ho'oponopono is to me. Thank you Dr. Hew Len, Joe Vitale, Mabel Katz, and all who are cleaning in this way. Thank you especially to Morrnah Simeona, the kahuna who simplified these processes so that many more of us can use them.